Are you looking for the best Routers ? Are you sure Huawei HG532D: ADSL2+ 300 Mbps Modem With Router is not available in market? 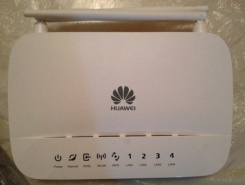 Huawei HG532D: ADSL2+ 300 Mbps Modem With Router from Huawei is listed in Routers category in revaalo. Reviews,Ratings, details and specifications of Huawei HG532D: ADSL2+ 300 Mbps Modem With Router. Works fine. But if too many devices are connected you need to login to admin and reboot it. Router range is average. Might have to restart more often. You cannnot connect the model with Android. It doesnt support sim card. I ordered it from amazon and the delivery was good as i have prime account. The product is good. working well for my home with some 4-5 devices connected, laptop and mobiles. Huawei has not delivered as per it's reputation. It has unstable WiFi especially with android marshmallow. When I contacted the customer care of Huawei, they did not accept warranty. Its just 3 months old product with manufacturing defects. Very dissatisfied. I ordered this router from Flipkart and delivered in time. I am really satisfied with this product, it has good features and it works fine, quality and price wise this is best product.